The cats have developed a lovely habit of scratching at the carpet in the bedroom in the morning when they want to be fed. 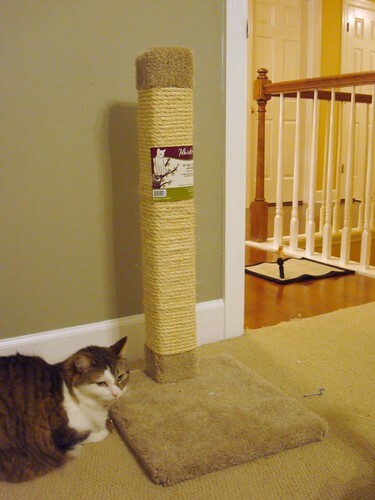 So, last weekend, we picked up both a scratching post and a scratching mat, hoping to entice them away to more appropriate surfaces. The scratching post has been sniffed, sat near, and (in one particularly hilarious moment) rather precariously climbed. The mat has been tentatively scratched and laid upon. Jack, however, took the irony a bit far when he decided to scratch right.next.to the mat. As in, the absolute closest that he could get, but not actually be on the mat. *le sigh* For now, the scratching post is in the bedroom, but I think it will move to the rec room and the mat will stay in the bedroom. You could try sprinkling some catnip on the mat and the post.